As you can see from the picture above they have put a couple of stickers on the window but this arena is not and never will be the real home of the Sparta Prague ice hockey team. This nightmare started in the 2014/2015 season which saw HC Slavia Praha (then tenants of the o2 arena) relegated to the WSM Liga. Slavia ended their contract with the o2 and moved back to their home at Eden ice hockey arena in Vršovice. *Probably a good thing as they seem to have lost 15,000 of the 17,000 fans that watched their play off final game in 07/08*. 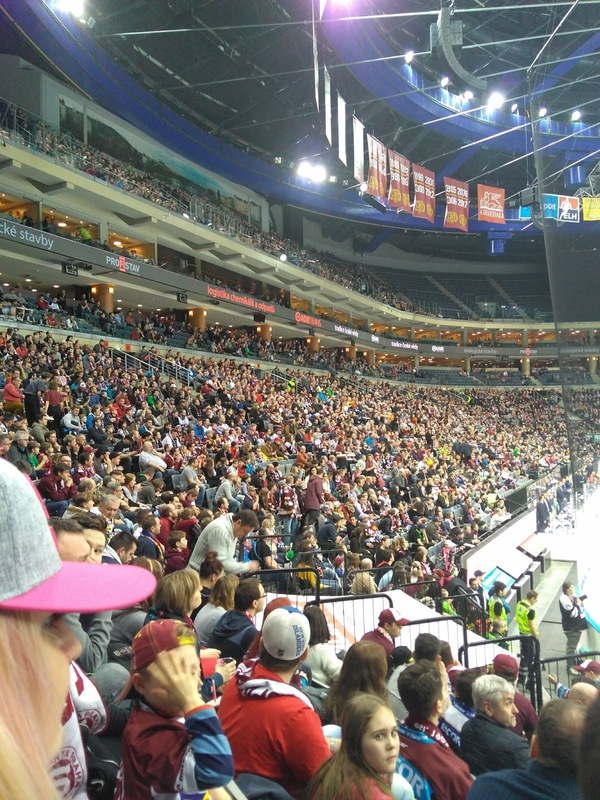 Sparta saw the opportunity (they are run as a business these days) and despite a huge backlash from the fans they went through with the move, leaving their famous Holešovice home to start the 2015/2016 season in the 17,000 capacity arena. The arena is what it is. It's quite a grand site when you first step inside and it's still the second biggest ice hockey arena in Europe but it just doesn't have the atmosphere that you can find at the country's other stadiums. It's an american style stadium. You have to put up with the popcorn and pizza smell throughout the match and despite average efforts of management the club have completely lost their identity. 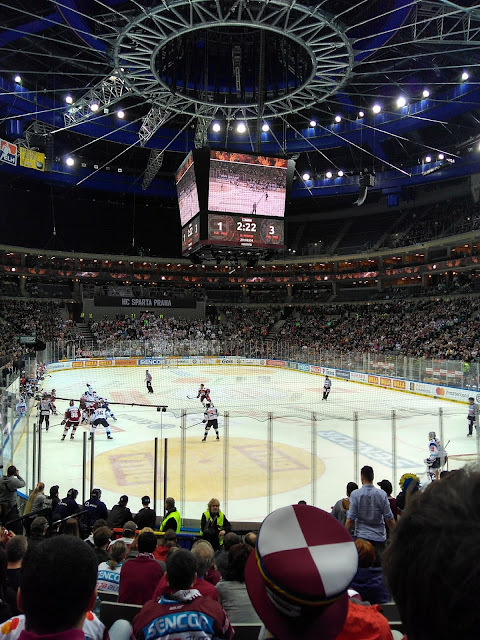 The kotel (main fans) try their hardest but they routinely fail to generate much of an atmosphere and there are some matches, against Brno and Hradec for example, where they are completely drowned out by the away fans. 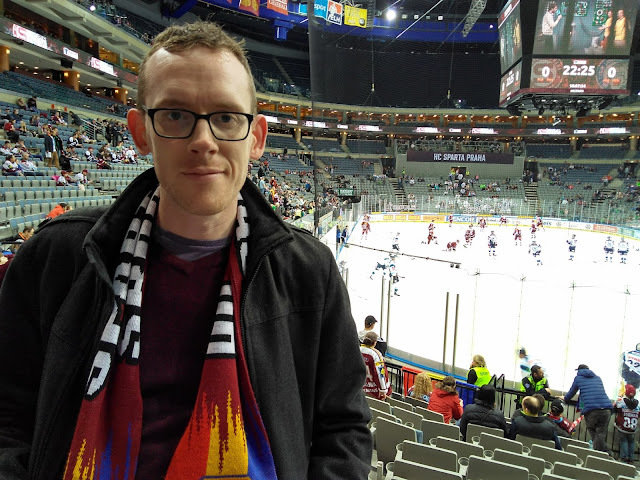 It's a sad site as the holešovice kotel was quite intimidating for away fans and this passion was transferred onto the ice. Despite all the negativity it was time for one last push to try and help the team get over the line and take this play off series to another game. In all honesty Sparta didn't really deserve to be there in the first place after what had been a disastrous season so it was pretty much expected that it wouldn't end well. The arena is easily accessible by underground from the centre of Prague (5 stops) and the great news is that as soon as you exit the underground station there's a brilliant little pub right in front of your eyes...Na Staré Ráně. The pub is decorated as a hockey rink and is full of old pictures and memorabilia. They have tank kozel 11 as well as pilsner urquell, gambrinus and 3 sestry beers all at very reasonable prices (around 30kc). I ran up the escalator, my mouth drooling ready for some tank kozel goodness. It was closed. The fact the owner planned his refurb during the play offs is testament to just how bad the season was as he obviously didn't expect Sparta to have too many more games. So plan B had to come into force for pre-match beer. One thing we didn't want was to go into the stadium. Another huge problem with Sparta is it's the only stadium in the country (to my knowledge) that don't let you in and out during the breaks meaning you are stuck drinking their overpriced piss beer (Staropramen). 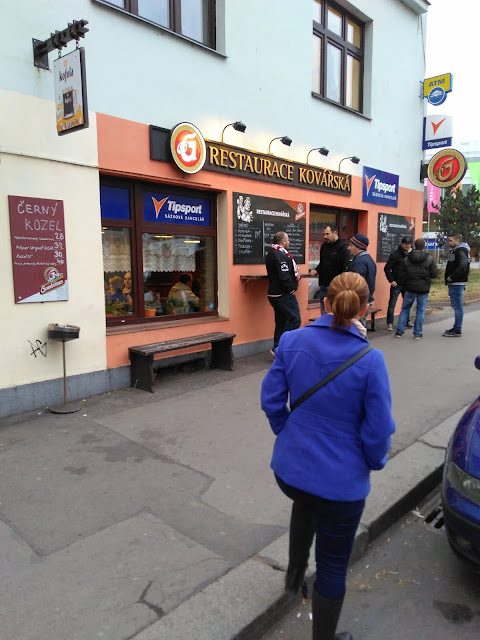 There are a few choices around but we opted for Restaurace Kovářská which is just by the shopping centre entrance to the arena. 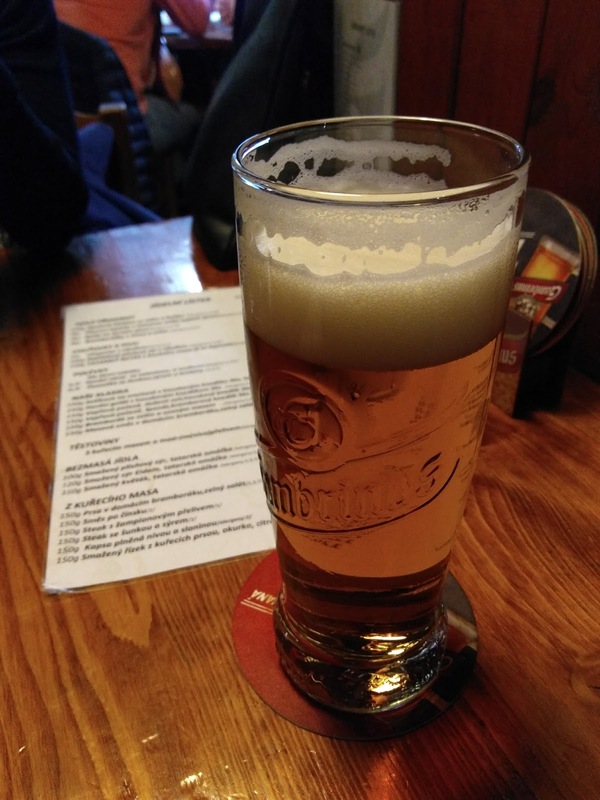 It seemed busy and had unpasteurised gambrinus for a reasonable 25kc (€1). There was a good pre-match atmosphere in the pub but I'm honestly not sure if I can recommend it or not. I spent the rest of the weekend incredibly ill and the culprit was either the gambrinus in this pub or the piss beer from the arena. It's hard to imagine the beer from the arena, as bad as it is, causing problems as they are pouring about 6 pints a minute at each kiosk. I do remember saying to Radka that one of the 5 beers I had there smelt a bit strange though so be aware! 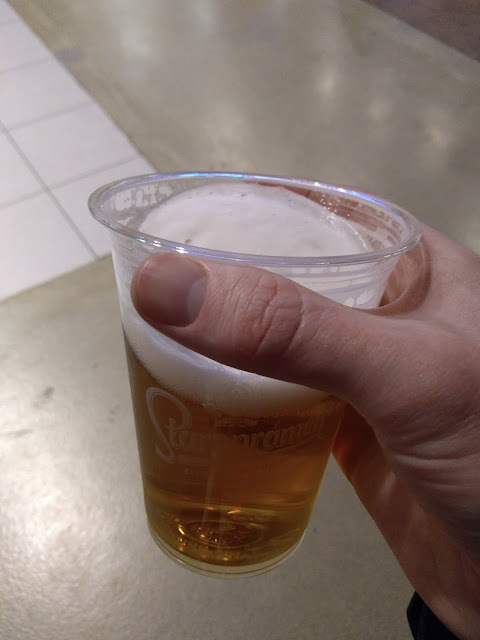 I was told by a brew master in a local microbrewery that the absolute worst beer you can buy in the Czech Republic is in the o2 arena. He's not wrong but when it's such an important match and it's Friday night you don't really have much choice. I had a few and the bill could have settled my monthly tab in our local. It's a bit strange that all the extraliga clubs have to sell Radegast for sponsorship reasons but Sparta still get away with this garbage. České Budejovice even relegated themselves in protest at not being able to sell Budvar in their stadium so I don't know how Sparta manage to swing it. Suspect 2: O2 Arena piss beer. 45kc and it's only 0.4l! Anyway. I was pretty fired up for the game. 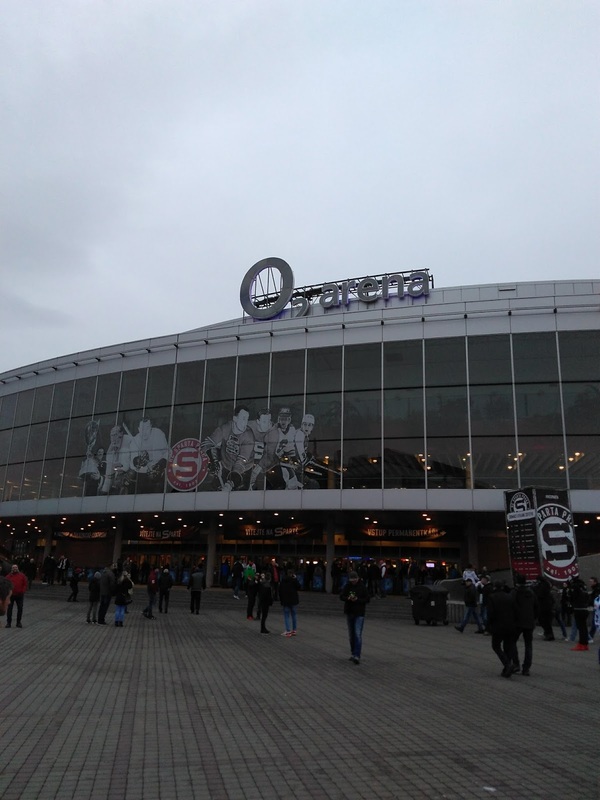 The series was 2-0 to Liberec who had won their two home games earlier in the week and as it was the pre-round it meant Sparta had to win to take it to a 4th game. The match didn't quite go to plan and despite a good start Sparta decided they wanted a long holiday this year and ended the season there and then with a 4-1 defeat. The entire season was a mess and that's what happens when you bring in top individuals but fail to actually build a team. I have a q&a with Sparta owner/manager/ex player Petr Bříza on the 5th April and I'm not sure he's gonna be ready for me! It doesn't look like Sparta are leaving the o2 anytime soon so we have to grin and bear it. There has to be a way to get a good atmosphere there but I think it's just too big and people are scattered around the place. The club try to fill it using several initiatives (sparta for schools, appreciating military/police etc, appreciating workers of Prague). These might fill an extra few hundred seats but it seems to me like it's a kick in the teeth to real fans who are paying full price, going to every game and following the team on the road. The cameras spend 70% of the match filming groups of school kids dressed in non-sparta colours (half of whom are probably Slavia fans) while ignoring the kotel who give so much time, money and effort to the club. There needs to be a balance between the business side and the sport side of the club. We can only hope it improves.